Digitas’ David Armano’s most popular link on his blog, “Logic + Emotion” has been his write-up on the “evolution” of creativity. Basically he advocates for creatives to become more generalized, and for “non creatives” to become a part of the process etc. With consumer behavior evolving toward a more empowered statusâ€”the definition of creativity has shifted from one-dimensional skills to a four-dimensional type of creativity that blends logical thinking with creative problem solving. 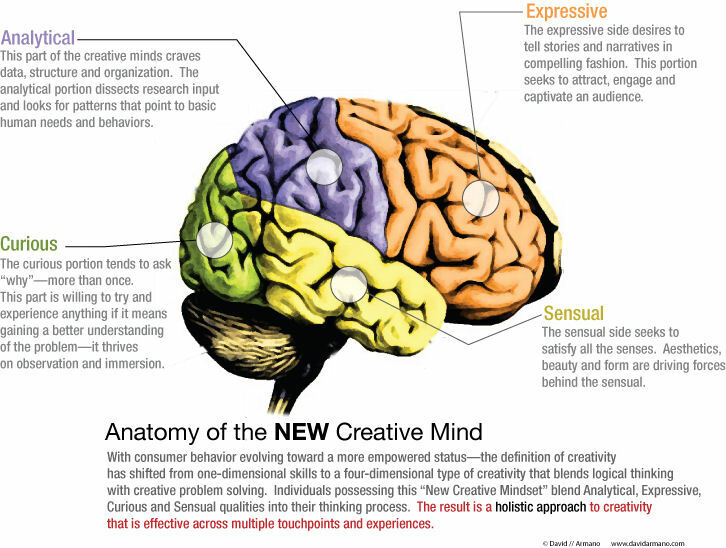 Individuals possessing this â€œNew Creative Mindsetâ€ blend Analytical, Expressive, Curious and Sensual qualities into their thinking process. The result is a holistic approach to creativity that is effective across multiple touch points and experiences. Can an Information Architect embody this kind of mindset? What about an Account Director? I think as human beings we are all capable of thinking like this. But as designers, communicators, marketers and creators of experiencesâ€”for us, itâ€™s even more critical to become multi-dimensional creative thinkers and problem solvers. One of the troubles we “creatives” seem to suffer too much from, is over-specialisation. We get really good at something- making TV commercials, writing comedy etc- that we forget the big picture. We like doing “Creative Stuff” for our client, but we have genuine zero interest in their actual core business. We’re too busy flying off to LA on filmshoots etc etc.